I noticed it one night last week, when I was coming out of the movie theater at 9 p.m. It was almost dark already. It always comes as a shock. Even though I know that the days have been growing shorter, for months, ever since summer solstice on June 21st. A few weeks ago I was down at the beach, watching the warm sunset light glowing on the shoreline. It was a balmy but cloudy evening. A moment came when the sun dipped beneath the low overcast lid of grey clouds, and a stream of firey light splashed across the treetops, illuminating them in a blaze of color. This was the first hint of autumn on the rise here, even though it is still officially summer. But it's never too early to tie some October Caddis flies.It only lasted for a moment, but I was able to get a quick picture with my phone. I shared that picture with friends. and my gifted fly fishing artist friend, Diane Michelin, decided to recreate the experience with watercolors. She captured the warmth of this moment perfectly here. 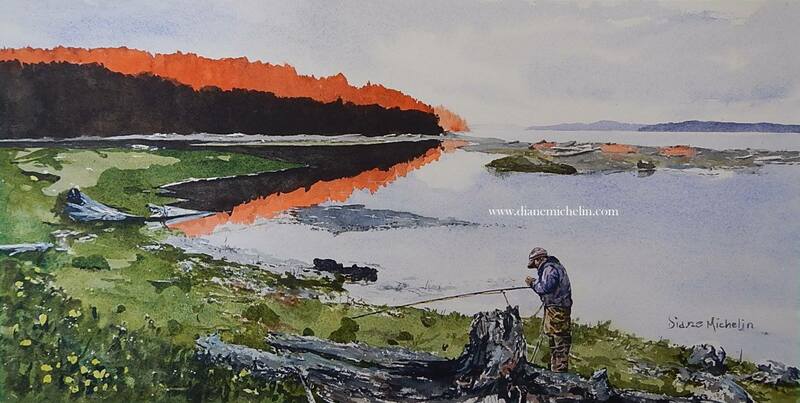 Go see her Diane Michelin Fly Fishing Fine Art page for more of her beautiful images. Diane is steeping herself in the wild country of British Columbia, where she paints and fly fishes. And she captures the fly fishing life in her art as few others can. Salmon fishing was closed here in Marine Area 9 two weeks ago. The quota for Chinook was met, and they are protecting coho salmon now too. Time will tell if they decide to reopen our beaches for salmon fishing, even if it will only be for catch & release, (which is all we do anyway!). We had been getting some nice cool weather these last weeks here, plenty of cloud cover, cooler nights and days, and even a few sprinkles of rain. This weekend is really going to warm up again though, at least through Saturday out here on the Olympic Peninsula. With all of this warmth and humidity we have been getting, the termites are hatching out a bit early this year. Tonight, when I was watering the garden, they were swarming all around me, fluttering their wings in my face, landing in my hair. I am going to tie some big fluffy termite flies now too. A Kauffmann's Stimulator, in sizes 4 to 6, ruddy brown, works fine at a time like this, in freshwater, and on the saltchuck. The rivers are running low this time of year, which is expected. And in some places the water will be a bit warm for trout fishing. But if you do some hiking up the rivers and streams, into the shaded reaches, amid the pocket water, and in the deeper holes, there's trout, and summer steelhead to be had out there. There's always some cooler water around, if you work for it. This fishing will favor dawn and dusk, but especially dawn as it will be cooler, and low light conditions, long leaders and quiet presentations. Once the water temperatures get above 60 degrees, that puts dangerous stress on the fish that we hook, play and land. Don't forget your stream thermometer! Summer run fishing. Look for the shade. Fly fishing for sea-run cutthroat trout on the Olympic Peninsula beaches is going very well this summer. And we have even seen a few resident coho around here too. The trout that have been out in the saltchuck all summer are growing fatter and stronger, and we'll have good fishing for them all through autumn again. There's some bigger herring and sandlance around now too, so don't be afraid to use some bigger flies, on size 6 hooks. I will usually guide for sea-runs through October. In my estimation, these are the best months for sea-run fishing. The mornings are crisp and cool, the days are tolerably warm and sunny, and the evenings are refreshingly cool again. Pick a tide and get at it! Pick a tide and get at it! This is probably the most relaxing way to fish for sea-run cutthroat. One angler, maybe two, Call or write for details. I am guiding fly fishers on the Olympic Peninsula beaches, rivers and streams. We walk and wade, or row along the shorelines in the dory, fly fishing for sea-run Coastal Cutthroat trout in freshwater and saltwater, and in the rivers for Cutthroat trout and summer steelhead. This is all strictly catch and release, traditional, barbless single hook, fly fishing only. Lunch, snacks, soft beverages, and use of some equipment is included. I also offer personalized and private fly fishing and fly casting instruction for beginners through advanced casters. I would be happy to help you plan your Olympic Peninsula fly fishing adventure, for all levels of ability, beginner to expert. Public presentations, Naturalist Guide, rowboat picnics, tide pool and river trail day trips. Please call, write or email for booking details. Now booking for April through October and beyond.